When it comes to owning a home, basic maintenance can often prevent costly repairs, and roof care is no exception. Of course, knowing your limits is important to keeping your home in good shape and keeping yourself safe. This is the first blog in a two-part series on roof care. Today, we’ll give you a few roof maintenance tips that you can usually do by yourself to extend the life of your roof. When is it safe to work on my roof? First of all, never go outside of your comfort zone to try to maintain or repair your roof. It’s just not worth it. If you are not completely confident working on your roof, just call a professional. Don’t chance it! Secondly, always pick a dry, sunny day to work on your roof. Wet or soggy conditions can cause slippage, and heavy winds can throw you off balance. Again, it’s just not worth taking that chance. We can’t stress enough how important common sense is in these situations. That said, there are still plenty of things you can do yourself to extend the life of your roof. After a storm, you may notice lots of loose debris on your roof. Sticks, branches, and leaves can accumulate and rot if not removed. With another person’s help, set up an extendable ladder and carefully remove the debris. Most of the time, signs of roof damage can be seen inside the home. Check your attic, ceiling, and drywall for discoloration or signs of moisture. This is often an indication of roof rot or leaks. You can also inspect the roof itself for visible damage. This can often be done from the ground with binoculars if you feel unsafe using a ladder. Check for missing, loose, cracked, or lifted shingles. Also look for signs of moss or mold and missing or loose flashing. If you see signs of moss, mold, or algae you can usually remove it by yourself (provided you feel comfortable doing so). Left untreated on a roof, moss, mold, and algae can break down the shingles and allow water to get under the shingles and rot or distort the wooden roof material. Gently spray a roof moss remover and cleaner on the affected areas of the roof. Follow the instructions for the specific cleaner you are using. This typically includes leaving the cleaner on for several minutes, then gently scrubbing or spraying it off. Keep in mind that a wet roof (especially one with moss) can be slippery; extra caution here will pay off. 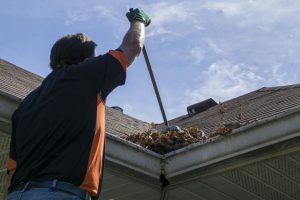 Cleaning gutters and downspouts is an ongoing job for a homeowner, but it is important to extending the life of your roof. Using rubber gloves or a small scoop, remove all debris from gutters and downspouts. Then scrub away dirt and grime with a soft-bristled brush. Again, remember that these are just general guidelines. Always err on the side of caution. If you aren’t completely confident repairing or maintaining parts of your roof, play it safe and call a professional. The professionals at E3 Roofing and Remodeling have the knowledge, experience, and tools to get the job done safely. Whether you need your entire roof replaced, want to schedule a free inspection, or you just have a few questions about your roof, we want to hear from you. Use this contact form, connect with us on Facebook, or give us a call today!